Foreword: I am not a movie buff, nor do I work for a cinema house. I am just an average movie goer, who likes seeing 'brainless' comedy, and family sentiment movies - preferably in Malayalam. Not that I don't love movies in other languages, but I usually prefer watching them on TV. I am one movie goes who like to watch movies in an air-conditioned theatre, and that rules out watching movies at my hometown - for the fact that we don't have an airconditioned movie hall here! To the best of my knowledge, there is only one proper Multiplex in Kerala - the Cinemax multiplex at Oberon Mall, Kochi. The multiplex was opened earlier this year, and has since offered a very different movie experience to movie goers. I have heard people often terming the high ticket charges of Multiplexes a daylight robbery - but, is that true? Kerala is known as a hot-bed of politics - with almost every single citizen interested in the daily political drama. Kerala has two major political fronts - left and the "right". 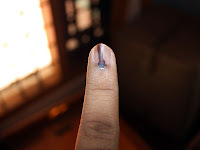 The left, "Left Democratic Front", is led mainly by the Communist Parties, while the "right", "United Democratic Front" is led by the Congress (Kerala Pradesh Congress Committee). In addition to the two fronts, the national party, Bharatiya Janata Party, too has been unsuccessfully trying to make a dent. In a state that is so interested in politics, the state assembly elections usually work on an anti-incumbent wave - the ruling party has to move to opposition irrespective of their performance. Metre gauge railways always have a sentimental aspect is a railfan's mind - I am not different! The news that the final piece of Metre Gauge railway in Kerala, the Punalur-Shencottah line was closing down brought tears to the eyes of many - and a ride on the last train would be a fitting send-off for this humble train from railfans. Although elaborate plans were made, everyone dropped off at the last moment, and I was left all alone to make the trip - not be let down in any circumstance, I decided to go solo. 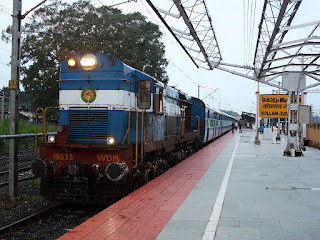 My initial plan was to take a train from Ernakulam to Kollam, then the new passenger from Kollam to Punalur and finally the metre gauge ride. The return was to be by bus. However, being a weekend, trains were heavily waitlisted - I first thought of going unreserved. After ten rocking days in Bangalore - including runs on the Mercedes Benz buses, a visit to a hospital casualty, getting two IV Injections, and laying on the bed for a full day down with fever (what more can I ask for??? ), it was time to head back home - to God's own country. Perhaps for the first time in my life, I never considered traveled in a State bus anywhere during planning for the return journey - both the KSRTCs were kept off my consideration. This time around, Kerala SRTC stood no chance of being even considered, while Karnataka SRTC was kept my last choice. Reason why Kerala SRTC was not even considered: A horrible hard product. The only feasible option for me is the 2200 AC bus from Bangalore - while the bus is known for punctuality, the ride and comfort is horrible. After the good experience on the MCV C120LE City bus, we (Myself and Bharat) returned to Majestic to find our way back home. We did some train spotting on our way back, and content with that short Mercedes experience, we were walking towards the City bus section of Majestic. All of a sudden, Bharat suggested we have a look at the "Mofussil" section to see if the inter-city Mercedes Coach was anywhere in sight. I wanted to see if the MSRTC Shivneri was still running as well. We, thus, headed in. The Mysore platform had a huge queue of Volvo buses, and an almost parallel line of Rajahamsas/Sheetal/Meghadootas. Dejected, we decided to return home, and just turned back. Mercedized.. all in a day! Monday, October 11, 2010 was a day I would not like to forget in my life.. a red lettered, three-pointed star day! The day was earmarked for "Travel(ing) with the Star". Yes, you guess it right - that was the day I did a back-to-back trial on two Mercedes Benz products in Bangalore. The two reviews would come in two parts. Presenting part-1. Conti Travels, or UMS Conti, is a established bus operator based in Coimbatore, Tamil Nadu. UMS, or United Motor Service, was launched in 1920. Since then, UMS turned into one of the most efficient passenger transport company in this part of Tamil Nadu. Conti Travels was the first Inter-city coach service in Tamil Nadu. UMS operated a few city buses in Coimbatore, under various names. I have vague memories of them, but I distinctly remember that their buses were well maintained during the mid-90s. UMS diversified into various business, and are now a formidable name in the electronics manufacturing industry. Why is Kerala RTC's premium services proving dud? The Kerala State Road Transport Corporation offers various "premium" services both within the state and on selected Inter-state routes. The premium portfolio of KSRTC includes 33 "Super Deluxe", 20 "AC" and 3 "AC Garuda" buses. Its been just 12 days since this month started, and its already been testing! Oh! Don't get me wrong: I've been testing different buses over the past week. It all started on October 8, 2010, with my first ever ride on an Isuzu LT1 (Swaraj Prestige) bus. Yesterday had something bigger, two tests back to back! A Mercedes Benz (MCV) City bus (C120LE) running on trial with BMTC, and then the Mercedes Benz Intercity Coach (O 500 R Two-Axle bus), recently introduced by KSRTC (Kar). Other than these three new products in the Indian bus market, I had two more firsts in my life. My first ever journey in a Kerala RTC "Super Deluxe" bus, and also a Kerala RTC "Super Express" bus. So the days ahead will be dotted with a few trial reports, and some photographs. Be sure to be right here! For the railfans: Sorry to disappoint again - the only bit of railfanning I did was seeing the 2008 Shatabdi rushing through Bangalore Cantonment yesterday behind a WAP1. ...It was more of a doze than a sleep. I could clearly hear whistles blown by gangmen, gurgle from umpteen streams and falls on the route, and the regular clickety-clack. We were certainly crawling (the ghats have a limit of 30kmph) - the weather was cold. I remained partially awake as we continued our crawl up the ghats. All this while, my coach was a beehive of activity, and the lone TTE was pulling apart his hair one by one - and was continuously being mobbed by passengers with unreserved tickets. To make matters worse, almost all stations between Mangalore Junction and Hassan issue manual tickets - the TTE is handed over a chart at each station. Each station has a quota of 8 seats each, and for these 8 seats, there would be atleast 20 passengers waiting!